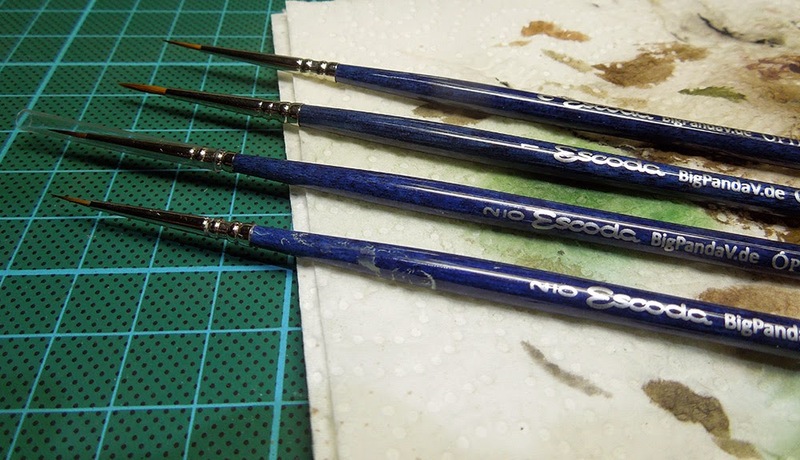 today we have another Mu for you - a Material Unpacked this time - and we will have a closer look on some brushes which are distributed by Big Panda V.
First of all let us say that these brushes are recieving a thumb up when you look at their price, the money you as a painter has to spent to get them. They are half as expensive compared to a Windsor&Newton brush. Talking about their price will directly lead us to their quality. 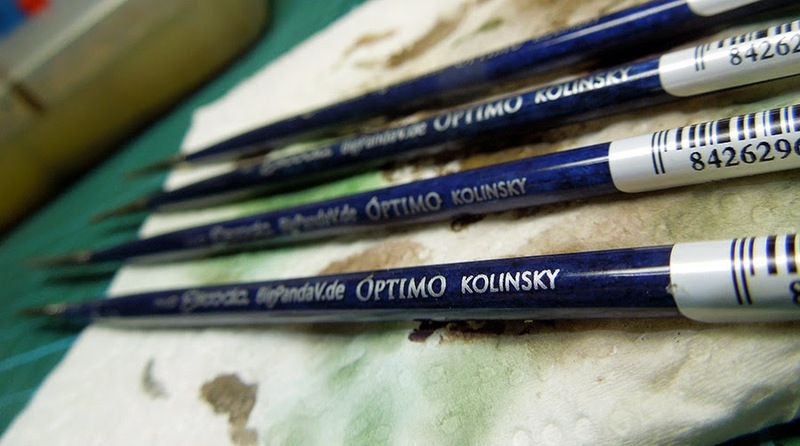 We did test these Kolinsky Sable brushes in the past months and we allow ourselves to give honest feedback. First of all they make a good impression when it comes to the quality of their tip and hairs. During painting we realized that they are good to work with. As we are mainly working with W&N series 7 brushes we realized that the hairs of the Big Panda V brushes to not have the same strength in their hair compared to a W&N series 7. While working with glazes, pulling and pushing thin glazes around they turned out to not be as comfortable when looking at the results we achieved. Good results can be achieved with them but it does not feel as easy as with the strong hair of a W&N and need a little training to understand the way the hair of the brush reacts when working with it. 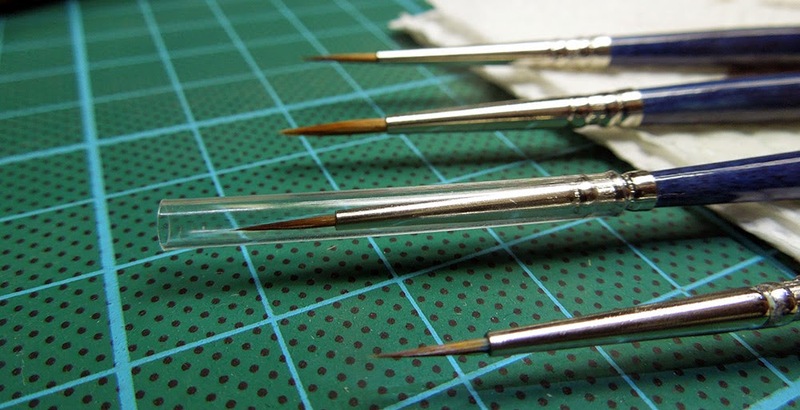 Their tips are good and you can work on details like freehands or small lines, but for glazing on bigger areas they lack in hair strength if you work with the side of the brush. Summed up we can say: If you are looking for brush that offers you a decent brush quality for a very good price you are right with this one via Big Panda V - Optimo BigPanda Brushes. They are available in different sizes and arrive in blue colour. If you want to test them yourself, give them a try! Good article, it is always difficult to find new brushes and brands that are worth it. It is good to know that this panda V is an alternative. That mark is the figure shows? Good article !! I would try these! Please, what mini is that? good brand... but the website seems to be only in german... cannot find the way to put in in english... difficult for non german speaker, or... I did not find where I can switch..
maybe I am a bit stupid ;) JA KLAR ! Sadly their homepage is only in german, yes.